Planning a baby shower is simpler and more fun when you have a theme for the party. A great theme provides inspiration for everything from decorations to food and favors, and it gives your shower a put-together, cohesive feel. There are lots of great shower themes to choose from, and one of them is bound to be perfect for the mom-to-be. Choose invitations that have a retro look, such as the Vintage Poster-Style Invitation from Pear Tree Greetings. You can even customize the colors to match any decor. You'll pay about $32 for 24 cards. For decorations, pick up a wicker bassinet, wooden high chair, or pram from your favorite resale or antique shop. You can also decorate with vintage baby clothes and booties, which you can easily find at thrift stores and flea markets. Don't forget to add bouquets in glass canning jars. Your favors should also work with your old-fashioned theme. If you're feeling creative, make some mason jar crafts, including a very useful soap dispenser. Alternatively, you can purchase personalized vintage milk bottle jars from Kate Aspen and fill them with colored candy. The jars range from $24 to $42 for a set of 12. A finger food buffet is a great choice to complement a vintage theme. Make miniature sandwiches, stuffed mushrooms, and other appetizers to give your party a sweet mid-century ambiance. Follow up with cupcakes frosted with pastel colors and displayed on a tiered cupcake tree. You can use traditional games with a vintage shower, but it's also fun to include one that is unique to this theme. One great idea is to have guests guess which pieces of baby advice were actually printed and recommended at various points in history. You can mix up this "real" advice with made-up advice that sounds equally old-fashioned. The Mommyish website has a great list of outdated parenting advice you can use for this game. Many parents love to find out the baby's gender before the shower, and some are choosing to reveal the results to shower guests at the event. Sometimes, the mom-to-be even requests that the ultrasound tech place the results in a sealed envelope so the gender is a surprise to her too. For parents who want to find out or announce their big news at the shower, there are lots of ways to incorporate a gender-reveal theme. Guessing Game Shower Invitation - This cute design from TinyPrints features both pink and blue and silhouettes of a boy and a girl. It costs $46 for 25 cards. Printable Gender-Reveal Shower Invitation - This printable design from Etsy seller, yourblissfulday, features storks carrying pink- and blue-wrapped babies. The file is $10 to download. The great thing about this theme is that you have lots of choices when it comes to decorating. To really play up the gender-reveal theme, include lots of boy-themed and girl-themed shower decorations in pink and blue. Again, the favors should incorporate a mix of pink and blue. One fun idea is to purchase baby bottle favors, like those available for about a dollar from Beau Coup, and fill them with a custom blend of pink and blue personalized M&Ms from myMMs.com. You can also have your local bakery make cookie or cake pops in pink and blue. Simply slip a cellophane sleeve over the top and tie with a ribbon. You can serve almost any tasty food at this shower, but the cake needs to be something special. Speak to the mom-to-be and find out ahead of time whether it's a boy or a girl. Then have the bakery create a cake that is either pink or blue inside. The cake can be frosted in a gender-neutral shade like white, yellow, chocolate, or a mix of colors. When the mom-to-be cuts the first piece, the inside color (and the baby's gender) will be revealed. A fun game for this type of shower is to have everyone get together to test out the old wives' tales that supposedly predict gender. Make a big poster with a column for each gender. As you try out the old wives' tale as a group, record your results in the appropriate column. Some fun predictors to include are the wedding ring gender test and the Chinese birth chart. A ladylike option is a baby shower with a tea party theme. This type of shower is perfect for an afternoon gathering, and it's the ideal choice if the baby is a girl. Ask the guests to come dressed for a tea party. For this party, choose a card that features tea cups, such as the Tea Bouquet from Basic Invite. This sweet pink invitation is feminine and fun and costs about $42 for 25 cards. For this party, choose decorations inspired by the outdoors, as well as tea-themed decor. 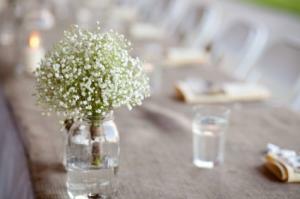 Place pretty bouquets of flowers on all the tables. 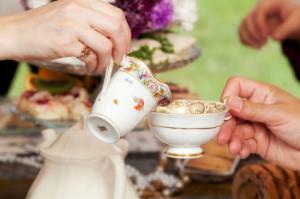 Use antique tea pots and cups and saucers, as well as your best cake plate and silver. These can serve as decoration, as well as vessels for serving food and tea. There are lots of fun favor ideas for this type of gathering. One fun option is to purchase a selection of different types of tea. Stack up six different tea bags, and tie them together with a ribbon or a piece of tulle. Of course, you'll also need several pots of different kinds of tea. Don't forget to include at least one decaf option, especially if the mom-to-be is avoiding caffeine during her pregnancy. Help guest really get into the tea party theme by having a create-a-hat activity table. Purchase several inexpensive straw hats, such as those available from Oriental Trading Company. A set of six hats retails for $24. Then pick up lots of fun trims at your local craft store, including ribbons, lace, artificial flowers, and tulle for veils. Have a couple of hot glue guns on hand and let guests make hat creations for the party. 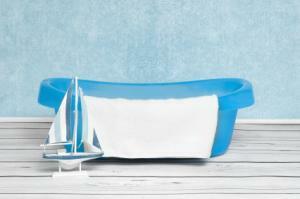 A nautical-themed sailboat shower is another fun idea. Although this party is a popular choice for baby boys, you can make it work for either gender. Host the party outdoors at the beach or seaside if at all possible, so guests can really enjoy this fresh and exciting theme. Consider the Baby Boat Shower Invitation from Minted. This invitation features a sailboat on a wavy lake. It's adorable for either gender or for a party where the gender hasn't been announced. This invitation costs about $64 for 25 cards. Make your own no-sew, sailboat-themed table linens by purchasing several yards of navy and white striped fabric, such as Premier Prints Canopy Stripe from Fabric.com (about seven dollars a yard). Then use pinking shears to cut the edges to fit your gift table, buffet, and cake table. Look for boat anchors, ships in bottles, and other nautical items from flea markets, thrift stores, and antique shops. Pick up some sailboat art prints to hang around the room or prop up on easels at the beach. You can find lots of great options starting at around $20 at AllPosters.com. Choose party favors that can double as table decorations. At a little over two dollars apiece, the Blue Sailboat Tealight Holders from Beau Coup are a great choice. The pretty blue glass candle holders would look beautiful at the beach, and guests will enjoy using them at home too. Create sailboat Jello by making a large batch of clear blue Jello and floating a toy sailboat on the surface. Serve sailboat-shaped cookies frosted in nautical colors. You can find a sailboat cookie cutter for about $5.50 on Amazon.com. Make deviled eggs to look like boats and add a triangle of red or yellow bell pepper to act as a sail. For a nautical-themed shower activity, create a photo booth with lots of sailboat accessories. Include sailor hats, toy sail boats, rubber ducks, life saver rings, and more. Another fun idea is to purchase a large glass bottle and have guests write messages of advice and encouragement for the mom-to-be. After the shower, give her the messages in a bottle as keepsakes from the event. A baby-q is a BBQ-themed baby shower, perfect for couples or for moms-to-be who don't want a lot of baby-centered attention. A large backyard or a nearby park are perfect venues for hosting this type of bash. Artist marketplace Etsy is the best place to find lots of fun baby-q invitations. There are dozens of designs, most under $20 for a file you can print yourself. For this shower, go all out with a picnic theme. You can find red and white checked table cloths at Oriental Trading Company for $16 per dozen. Add in lots of fresh flower bouquets for a pretty touch. Don't forget to scatter some old-fashioned wicker picnic baskets around the party too. Let guests take the barbeque theme home with cute mini picnic basket favors from The Knot Shop. They retail for around $12 per dozen. Fill the little baskets with red jelly beans, butter mints, or another tiny sweet. Yard games are the perfect activity for a baby-q. Get out the croquet set and the bocce balls. Everyone will have fun playing these outdoor games together. If this is the second baby for the mom-to-be or if she already has most of the baby gear she needs from another shower, a diaper shower is a great choice. For this party, guests bring diapers instead of or in addition to a gift. Choose a diaper-themed invitation like the Dotted Diaper from Tiny Prints. It costs about $25 for 25 cards. In the text, be sure to specify the size and brand of diapers guests should bring and whether the diapers are in addition to or instead of another gift. For this type of shower, a diaper cake makes a great centerpiece. 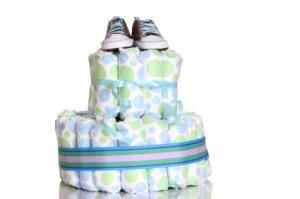 You can make your own diaper cake with lots of diapers and some craft supplies. Other decorations can include hanging diapers from a clothesline and using diaper pins to attach bows to chairs for the guests. To stick with the diaper theme, have a local bakery make up a batch of diaper-shaped cookies. You can even have the cookies personalized with the date or the name of the baby or mom-to-be. 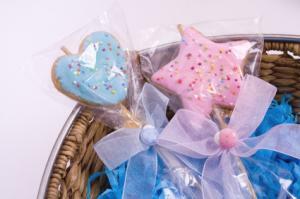 Slip each cookie into a cellophane bag, tie with a ribbon, and present it to guests. Serve diapered pigs, a variation on pigs in a blanket. Use refrigerated dough to wrap a "diaper" around the bottom half of a cocktail-sized hot dog and then bake according to the directions on the package. 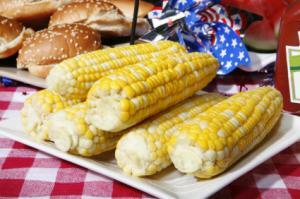 You can accompany these with standard shower favorites like veggies and dip, fruit skewers, and chips. For desert, make pink or blue frosted cupcakes with diaper pin toppers. You can purchase a set of 12 pin toppers for about $2 from Cake Connection. There are lots of great baby shower diaper games you can play, including speed diapering and having guests pretend to be "diaper bag psychics." Another option for moms-to-be who already have their baby gear covered is a stock-the-freezer baby shower. This type of shower is a huge help for busy moms, especially those who already have other children. 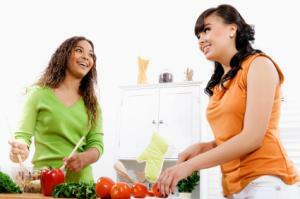 At the shower, everyone gets together to make frozen meals for the mom-to-be. Since this shower takes place in your kitchen, focus on decorating this room. Use some fun baby shower signs, as well as pink or blue balloons. A cooking-themed favor is a great choice for this shower. One easy idea is to give guests wooden spoons. You can find these spoons at any local home or cooking store. Using a pretty piece of ribbon, attach printed copies of the recipes you are making. Because you'll be spending so much time cooking at this shower, order take-out food from your favorite restaurant to eat at the event. Serve everything on nice dishes so it feels special, and follow up with a special cake for the mom-to-be. The focus of this shower is making food for the mom-to-be, so that will be the primary activity. You can also include an advice station, where guests can write tips for childcare and cooking on recipe cards. You can help the mom-to-be create a library for her little one by hosting a storybook baby shower. For this shower guests bring a book for the baby, and you can play story-themed games. No matter which baby shower theme you choose, you'll find that planning your shower is much easier when you have a central focus. Everything from the food to the games will seem well-planned and perfect for the event, allowing you to relax and enjoy being the hostess.